For millions of years, Galapagos Islands ecosystems have been evolving into the truly unique animals and extraordinary landscapes that we know today. In fact, the Galapagos Islands were among the first group of sites added to the United Nations Educational, Scientific and Cultural Organization (UNESCO) World Heritage List in 1978. And because the islands are so singular, they draw hundreds of thousands of tourists every year who come to marvel at their rich fauna and flora. While ecotourism has brought a great economic benefit to Ecuador, those same tourists can also pack in some problems: they have the potential to harm or even destroy the very wonders that they seek to experience. As tourism soars, so does the number of airplanes and cargo ships arriving from the mainland, carrying food and other supplies. Such vessels are the primary vectors for new, potentially catastrophic invasive species. In addition, rapid tourism growth strains the limited natural resources of the islands and has led to an explosion of new businesses that specifically cater to tourists. By 2007, in fact, the Galapagos Islands World Heritage site had been put on another list: the List of World Heritage in Danger. In addition to the problems too many tourists can cause, overfishing took its toll. However, because of Ecuador’s progress in strengthening conservation measures and putting tourism regulations in place, the Galapagos were removed from that roster in July 2010. In the past decade, however, tourism has grown exponentially. According to Galapagos National Park statistics, between 2007 and 2016 overall visitor arrivals in the Galapagos Islands increased by 39 percent (from about 161,000 to more than 225,000). During that same period, the number of visitors participating in land-based tours increased from around 79,000 to 152,000 (a 92 percent increase); while ship-based tourism actually decreased, from approximately 82,000 visitors to just over 73,000 (an 11 percent drop). And now, once again, UNESCO is taking a look at the Galapagos Islands. Deeply concerned about the current rate of tourism growth, the International Galapagos Tour Operators Association (IGTOA) sent a position letter on February 13, 2018, to Ecuador’s minister of tourism, Dr. Enrique Ponce de Leon Roman, in an effort to open a dialogue and gain some illumination on the nation’s future plans for overseeing tourism in the Galapagos Islands. 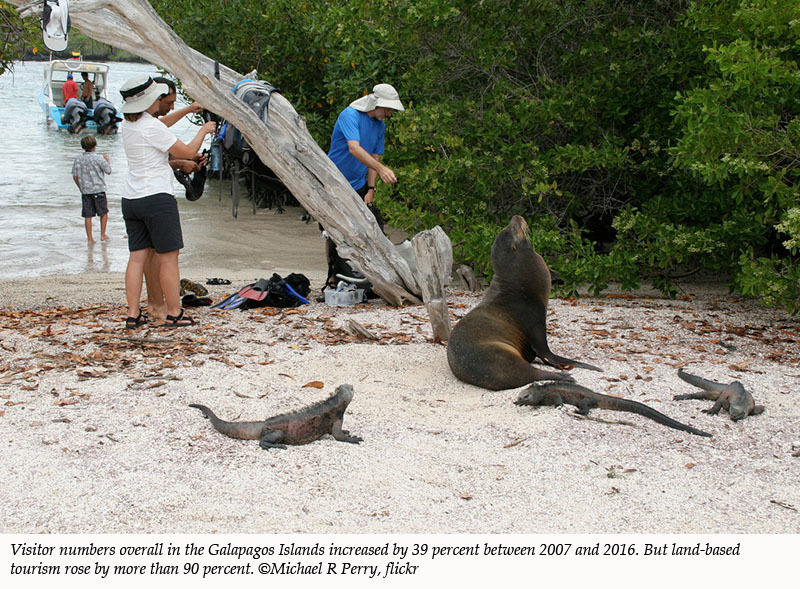 Believing that the tourism industry has an obligation to help ensure that tourism remains a positive force in the Galapagos—one that encourages and supports their lasting protection—IGTOA asked that burgeoning land-based tourism be regulated as much as ship-based tourism has been since the 1970s. At its 42nd convention, held on July 4, 2018, in Manama, Bahrain, UNESCO’s World Heritage Committee adopted a decision on the Galapagos Islands. In that decision, the committee recognized the measures that Ecuador has taken to discourage rapid and uncontrolled tourism growth in the Galapagos and the nation’s stated commitment to a “zero-growth tourism model.” However, the committee went on to request that Ecuador develop and implement a clear tourism strategy that “ensures that suitable measures are sustained in the long term as permanent regulations, including maintaining the moratorium on construction of new tourism projects and the limits on the number of flights.” In 2016, the World Heritage Committee had made a very similar request, indicating that little tangible progress had been made in the intervening two years. Marc Patry, an IGTOA board member, is among those who say that they, too, are disappointed in the UNESCO World Heritage Committee’s decision. “UNESCO basically repeated the same request it made years ago,” states Patry. “The government of Ecuador needs to do something to control the very rapid growth of tourism. We know it comes exclusively from land-based visitors, yet UNESCO didn’t single out that specific type of tourism and appears to be happy with the government’s nebulous promises to eventually do something about it,” he says. 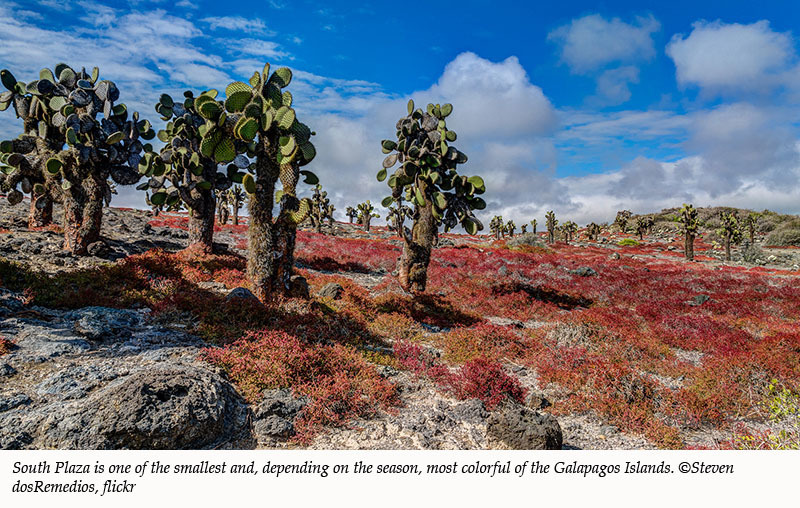 But can the fragile environments of the Galapagos Islands weather the growing pressures of land-based tourists through the next two years? The longer the government of Ecuador waits, the more entrenched vested interests—including those who have benefited the most from the explosive tourism growth of the past decade—will be, leading to even greater resistance to further restrictions. Rather than packing in more potential problems, perhaps what the islands really need are some possible—and punctual—solutions, and IGTOA is keen on helping Ecuador find them. A multiple award-winning author and writer specializing in nature-travel topics and environmental issues, Candice has traveled around the world, from the Arctic Circle to Antarctica, and from New Zealand to Scotland's far northern, remote regions. Her assignments have been equally diverse, from covering Alaska’s Yukon Quest dogsled race to writing a history of the Galapagos Islands to describing and photographing the national snow-sculpting competition in her home state of Wisconsin. In addition to being a five-time book author, Candice's work has also appeared in several national and international publications, such as The Huffington Post and Outside Magazine Online. To read her web columns and see samples of her nature photography, visit her website at www.candiceandrews.com and like her Nature Traveler Facebook page at www.facebook.com/naturetraveler.